Recently I received a letter in which the writer called me to account for advertising healing CDs, which help to change our physical and mental status in a positive way, if once according to ‘certain doctrines' "everything is written in advance, and we cannot change that even if we stretch ourselves. " At first I was a bit upset because I felt that my writings so far have been in vain, because, behold, once again, someone wants to put my head in a yoke! The second letter of the young man calmed me down however, in which he explained, that he only asked, because he knows someone who is firmly convinced of the insistent truth of the quoted sentence, and while reading my materials he could not decide which teaching he should accept? Well, I said, "Behold, this is free will". After the response to this letter I received Forrest Gump on DVD. Since that time I only saw the movie in the Cinema in Czech language, I thought I see what the Hungarian interpretations of the English dialogues are. I had this feeling several times after seeing an American movie in both languages, like they were not the same movie I saw. The Hungarian thinkers’ 'wheel' slightly spins different. It happens often, even these days that we understand the Slovak and the Hungarian translations completely differently, while the original version is about something else entirely. Mostly - at least according to my own experience – it is not the Hungarian synch, which reflects the original. In the simple life philosophy of Forrest Gump fortunately none of the interpreters have been lost; it was returned what was mentioned in the original language also. No one needs Gump’s simple set of mind, although his love of life, his wondering eyes revealed to the world, or the simplicity of things, are just the consciousness and state of mind most spiritual schools teach. The film is a beautiful example of how all these take place in most spiritual teachings: the more complicated they are, the more people 'pass out' from them, however the number of 'specific' misleading interpretations will increase in proportion to the complexity of the teachings. 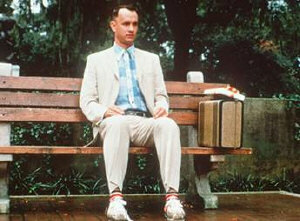 Forrest reveals the world to us too simply to accept it immediately. Errant in the intellectual fog are unable to understand him. Only those can realize his magnificence, who had been tormented in life enough to be able to see with their hearts. The majority only laughs at his seemingly impossible behavior, and if we ask why they love this movie, they could not give an answer. Gump's pure and simple personality is what makes this creation attractive, as the question of my correspondent goes through the movie: "What is written and what is merely a coincidence?" Is there coincidence at all? This philosophical line many however are not even aware of. Since the beginning of the film Forrest has peacefully surrendered to the tests. He peacefully tolerates the brace, though his foot is not sick, he is using it only for yielding to her mother’s obsession. The miracle is not that he is able to walk, but that fate established the conflict where three striplings want to catch and beat him, but because the splints fall off while Forrest is trying to escape, so anyone in the world can see that he is completely healthy, and able to walk. Despite his ineptitude, he is successful in both sports and military life. He does what he has to. His ineptitude is also a blessing because he does not ‘contemplate’ on when and where to go, just does what the moment dictates. Is it not what the Eastern teachings say: do not fight, but let things happen!? "Learn to swim with the current!?" In the jungle, Forrest listens to his instincts by rescuing his comrades. He does not care about shooting, that he is exhausted, only about fulfilling the purpose to rescue BB - and anyway the others 'incidentally'. In spite of the high-ranking military honors, sport careers, fame, there is nothing more important to him than not getting in a car he does not know the driver of. He uses fame, money only as a tool to help others. 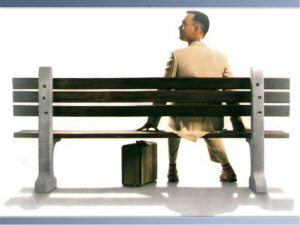 I think it reflects the creators’ special sense of humor that the film is full of 'coincidences', when Gump helps others to reach fame. But believe it or not, such phenomenon really exists! I mean, that the key to the task, what we brought down into our lives, is possessed by another person! The encounter therefore is necessary, since this is the only way to fulfill our mission. The starting key of such information can be found in the aura, so often there is no particular need for a dialogue; it is enough to meet on the physical surface. For example, if you bump into somebody in a shopping mall, or even like in the case of Gump, while running, he dried himself in someone’s T-shirt, and the energy transfer already has taken place. Why this is so, I do not know exactly, but I am told that those who have prepared for life on earth at the same place, place a starting or more precisely, a reminder key in each other’s energy system, which is responsible for gently reminding the individual when arriving to the earthly plane forgetting what he or she came here for. Well, there are a few examples of this phenomenon in the film. Another of such 'free will' examples is the one of the captain’s. At first, he is angry at Gump for rescuing him. He is convinced that he should have died, instead of living such unworthy, miserable life. Well, this is a beautiful example again, that, if we do not have enough humbleness towards life, we can get into quite humiliating situations. Self-pity has led the captain to alcoholism, and Gump after saving his body, saved his soul also. How did he do that? Certainly not with holy speeches. He simply has showed an example. He was going to church for singing in the choir generating a powerful spiritual force field, which helped the captain to enjoy life again. The third interesting and accurate character is Jenny’s figure. By seven years of age we develop trust in others, and the desire for security. These were damaged in Jenny several times. She has lost her mother early, but children feel safe only in their mother’s aura until the age of 7. This alone is enough for developing a personality unable to trust others, who is always afraid that the other person leaves. In addition, Jenny was raped by her father at the critical life period of age 7 to 14 years, when the father model builds in for girls. These models are very important, because girls are looking for a partner appropriate to the father model. But if a bad program like that is not unbounded, the lady concerned will attract violent partners again and again. 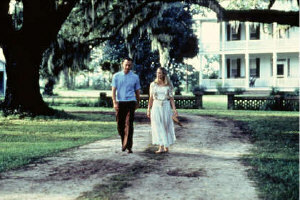 Gump offered safety, was gentle to the girl, loved her, but this was such a high vibration for Jenny to live with day by day. The birth of the child has healed Jenny’s damaged chakras, so she became capable to inherit the higher frequencies of love, but this came too late for healing the damages caused by lot of yearning after death. Jenny did not commit suicide – although she attempted many times – but as the result of many years of self punishment has attracted a deadly disease, which had just took her away when she dared to live. Is this cruelty? Looking with a human eye and brain, yes it is. From the soul point of view Jenny’s lesson –no matter what kind of example she got in her childhood - was likely to dare to love. And she succeeded in this. It is not asked on high whether it took a week, a year or a hundred years. Only if it was accomplished what was undertaken. I have spoken about the programmed behavior patterns. I note, if we do not start working on ourselves, always the same things will happen to us again and again until a bold entrepreneur rewrites the family legacy. Jenny did not know - at least the one in the movie - a healer who would have unbounded this from her, she has given this heritage to her son, so at the age of five he also could lost his mother - that was Jenny. Returning to Forest, is it not amazing, that his soul was neither disturbed by war, nor sport success, nor a lot of money? 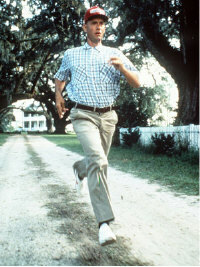 He has remained the same Forrest Gump. He did not want to possess anything or anyone. He did not fight any love, intellectual or moral battle with anyone. He did not want to change anyone, and did not hold moral parables. If we examine a Buddhist monk thoroughly, I am sure that he has the same values as our protagonist. Forrest had only one property ‘perceived negative’, that he talked and talked. He did not talk about others; he only talked his story, healing himself by telling his problems. Let it truly be the question of free will through what filter someone looks at it, and what is taken out of this for learning. "I don't know if we each have a destiny, or if we're all just floating around accidental-like on a breeze"
Well, I really cannot answer that, it depends on the person.